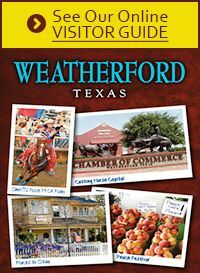 The Weatherford Chamber of Commerce provides cost effective marketing opportunities for members through a variety of online and direct initiatives. We offer a complete ribbon cutting package service for your grand opening, relocation, expansion or milestone celebration. Package includes pre-event Email blasts, included on Chamber calendar, use of the giant scissors or decorated shovel and a big red ribbon. No store front, no problem, you may have your ribbon cutting at the Chamber office. Bring your advertising items to the Chamber office to include in the Newcomer bags given to potential new Weatherford residents. Newcomer bags contain items such as brochures, pens, calendars, magnets, flyers, business cards and coupons. Your opportunity to be creative! Promote your business news and events on Facebook, Twitter and online calendar. Logo is placed at the top of the page under your category. Only one company per category to be renewed annually.